LA MODULAR 2016 is a synth event that presents some of the most legendary and influential names in electronic music spanning the last four decades. Renowned Atlanta based artist, Richard Devine; esteemed founder of Mute Records, Daniel Miller; musician and synth manufacturer, Cyrusrex; and founding members of Nitzer Ebb, Bon Harris and Douglas J McCarthy join West Coast knob twiddlers, Baseck, Rodent 516 and Anthony Baldino for a remarkable evening at the delightful Teragram Ballroom in Downtown Los Angeles. Douglas Solo Show in Los Angeles on April 07,2013! Douglas makes his first appearance on The Echo stage for Part Time Punks, playing classic Nitzer Ebb tracks as well as brand new tunes from his debut solo LP on Pylon Records, Kill Your Friends. Don’t miss this rare live appearance by one of the true pioneers of electronic music and the EBM scene. Live At Markthalle Hamburg will be released on February 1st, 2013 as a strictly limted edition of just 500 copies, presented in a gatefold sleeve with full colour inserts! There will be two versions available: a transparent edition of 400 copies and a luxury box-set which includes a red vinyl version with 100 copies T-shirt, metal pin badge, flag and poster. 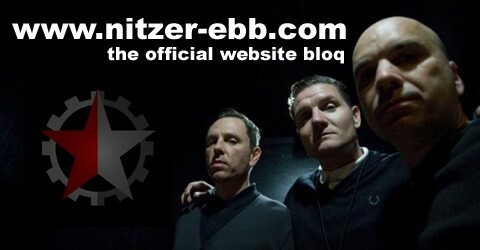 Nitzer-Ebb.com wishes all fans, friends and supporters a merry Christmas, much happiness and optimism at the turn of the year and good fortune and success in the New Year. Many thanks for your loyalty and support! NEP Live At Markthalle DVD ready to release! The long awaited Nitzer Ebb DVD Live At Markthalle (Limited Edition DVD) featuring the 2011 Hamburg Show, Nitzer Ebb live at the Blackfield Festival and a Band Interview. Preorders can be made in the Major Records Shop and european customers may order at the Neuwerk Music Shop as well! Official Release Date is December 02nd, 2012 with Catalogue Number 1NEPDVD2012! Finally! NEP DVD will be released on December 2nd, 2012! Please note the following information from Major Records: use the Major Records Online Shop to order your copies of the Nitzer Ebb DVD! Major Records have registered all of your mails, so everyone who mailed Major Records will definitely get their copy/ies. Please note, that only print 5000 copies worldwide, so order your personal (numbered) copy soon, if you haven’t done so yet. Major Records have limited the pre-orders per customer to a maximum of 10 copies to make sure that everyone will get one. The Nitzer Ebb DVD Live At The Markthalle will be released on December 2nd, 2012!